There are two conclusions we can make from our poll on the Wisconsin conflict: the state is very closely divided, but it leans slightly to the union side of things rather than Scott Walker's on pretty much every question we asked. On the biggest picture question: do you side with Governor Walker or do you side with the public employee unions 51% of voters in the state go with the unions to 47% who stand with the Governor. On another broad question: do you side more with Governor Walker or with the Democrats in the state Senate, 52% of voters go with the Senate Democrats to 47% who go for Walker. And perhaps the clearest indication that Walker has lost a majority of the voters in the state in this conflict, if only a narrow majority, is that 52% of voters now disapprove of him to only 46% who like the job he's doing. Those numbers are basically the inverse of last fall's election results. When it comes to broader questions about rights for public employees in Wisconsin the margins are less narrow. 57% of voters think that workers should have the right to collectively bargain for wages, benefits, and working environment rules compared to only 37% who think they shouldn't have those rights. And 55% of voters think that public employees should have at least the same rights they have now, if not more, compared to only 41% who believe they should have fewer rights. Key on both of those questions about rights for public employees is that a majority of both union and non-union households stand with the workers on those issues. Union households support collective bargaining by a 70/26 margin, but non-union households do as well by a narrower 51/42 margin. Union households think public employees should have as many or more rights than they do now by a 66/32 spread, but so do non-union households by a 51/45 one. Ultimately one of the biggest questions moving forward is whether a recall of Scott Walker would be a viable avenue for pro-union supporters. Right now it looks like it would be a 50/50 proposition. 48% of voters say they would support a recall, while 48% are opposed. That issue's about as polarized on party lines as it could possibly be- 87% of Democrats support a recall, 90% of Republicans are opposed, and independents split narrowly in favor of it by a 48/46 spread. With such a closely divided state Walker's fate would very much be determined by who could better turn their troops out- last year Democrats were asleep at the wheel and let Walker get elected but it might be a whole different story if voters in the state got a chance to do it again. - Is this a poll of registered or likely voters? If the former, do you think there's any reason in particular regarding the difference of reported 2008/2010 #s from actual ones? Did you also poll the Republicans vs Obama and/or the Republican primary? Will we have those reslts later today, tomorrow or when? Walker wouldn't stand a chance in a recall. However, I wouldn't trust Russ Feingold to beat him. That man seems more concerned with his anti-establishment image than with actual governing. Herb Kohl would have beaten Ron Johnson by 20+. Critics of this poll are pointing out exit polls showing 26% of 2010 voters were union households vs. the 32% number here. That 32% is higher than in 08 as well. Any response on that? "Is this a poll of registered or likely voters?" "do you think there's any reason in particular regarding the difference of reported 2008/2010 #s from actual ones?" Yeah, different voters turning out/responding to the poll. Last year's formula was quite simple: record GOP turnout, and a depressed Democratic base in Wisconsin meant one of the country's largest "enthusiasm gaps." 2012 will probably not be quite as historic a Democratic turnout as 2008 was, but much closer to 2008 than 2010. Our poll is of registered voters, but the more interested you are in politics and voting, the more likely you are to answer the phone and stay on the line for the whole poll, which mirrors their likelihood of voting. 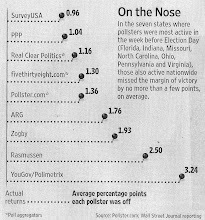 Registered voter polls for presidential elections, which have wider turnout than midterms, are closer barometers of the turnout than registered voter polls for a midterm, which see a much narrower and less predictable set of voters turn out, and tend to lean GOP anyway, particularly last year. "Sample appears seriously skewed. 47% say voted for Walker, but reality of election result was 52.3% so seriously underweight Walker voters. Also, sample is 32% from union households, but only 26% in Wisconsin from union households, so overweight union households." See what I said above. A lot of potential Barrett voters who will vote in 2012 (or would vote now) stayed home last fall and have been even further galvanized by this fiasco. Also, 26% and 32% aren't a whole lot different, but union voters are a pretty well organized bunch. They turn out at a higher rate than some non-union voters, meaning they'll make up a larger share of the electorate than their share of the overall population. "Did you also poll the Republicans vs Obama and/or the Republican primary? Will we have those reslts later today, tomorrow or when?" Dude, do you understand the concept of patience? We release one set of results each day during the week. That's been our M.O. for a long time. The 26% figure comes from 2010? Of course it'd be higher now, since union members have been stirred to action. It'd probably even be higher than in 2008 if an election were held now. If unions and the Democratic Party in the state can keep those workers angry and organized, that anger could probably cause an even bluer election in 2012 than 2008. If it subsides, you're still looking at an election closer in turnout to 2008 than 2010. Do Republicans think 2010 was the norm and that voters shifted to the right? You must have thought the we would blindly accept your results without examining your method. You thought wrong. Your sample does not reflect an accurate population of the state. You included 32% of union households and Wisconsin is closer to about 20%. Why the misrepresentation? Trying to make a point? That last paragraph says a lot. If Walker's approvals are bad now, it's hard to see how they're going to get better. Walker's on the verge of increasing the unemployment rate in Wisconsin and it's hard to see how it'll be seen as anything other than a voluntary move on his part. Even if the recall numbers are unchanged, Republican voters may stay home, while the Democrats remain energized. This is especially true if Walker wins this showdown with Democrats and the unions. All in all, I'd say things look bleak for Walker. Even if he survives a recall, he'll have blown a good chunk of his reelection fund defending himself. As a result, he'll go into the next election cycle under-armed. The inequality illustrates why libertarians are wrong about everything. It is not possibly true that the people at the top have been working that much harder. It's not supply and demand that has distributed wealth that way. There are a lot of factors involved, not least relentless "free market" propaganda supported by the likes of movement libertarians, who seem to think that EVIL THEFT is happening only among the poor and working classes, even though they've seen absolutely no gain from all their years of supposedly rigging the system in their favor.